In the eight years that Romesh Sobti has been in the driver's seat, the bank has increased its profit from Rs 75 crore in 2007/08 to Rs 2,286 crore in 2015/16. When Prime Minister Narendra Modi announced the recall of 500 and 1,000 rupee currency notes at 8 pm on November 8, those working at One Indiabulls Centre in Mumbai's Lower Parel rushed to the ATM of one bank - IndusInd Bank. This despite the fact that the premises also have ATMs of three other banks. The reason: IndusInd is the only bank whose ATM machines allow you to choose currency denominations. "The rush was due to our offering called Choice Money, introduced seven years ago. This came in handy for people who wanted only 100 rupee notes," says Romesh Sobti, Managing Director & CEO, IndusInd Bank. "That is why 80 per cent people who use our ATMs are customers of other banks," he says. This helps the bank attract customers. "Almost 5 per cent ATM users become our customers," he says. Choice Money is one of the several unique services that IndusInd Bank is known for. "We come out with something new for customers almost every six months. This is because when you're not a high street bank and an unknown brand without presence across geographies, you have to ask - why should a person bank with me? So, we think very hard about ways to make people bank with us. That is why we go beyond service and great conveniences that have never been asked for," says Sobti. In the eight years that Sobti has been in the driver's seat, the bank has increased its profit from Rs 75 crore in 2007/08 to Rs 2,286 crore in 2015/16. Total income rose from Rs 2,178.2 crore to Rs 14,877.6 crore, while net non-performing assets, or NPAs, fell from 2.27 per cent to 0.36 per cent during the period. This made Sobti the jury's unanimous choice for the Best CEO in the BFSI category. BFSI stands for banking, financial services and insurance. While Sobti has been hugely successful in transforming the bank, the job has been far from easy. "When we took over the management, the bank's loan book was badly impaired. So were capital, talent base and infrastructure. Growth had stagnated and no fresh investment was happening," he says. Sobti started off by bringing in fresh capital and addressing the problem of bad loans. "We built a business model. In the first 12 months, we brought in capital and talent, and put emphasis on loan recovery," he says. The bank did not open any new branch for two years. The efforts paid off. Within 10 months, it recovered a big loan given to one of India's largest conglomerates with interests in oil & gas, steel, shipping and information technology. "Suddenly, the profile of our loan book changed. Gross NPAs fell from 3.2 per cent to 1.3 per cent, and net NPAs from 2.27 per cent to 1 per cent." Sobti started working on the bank's strong areas such as vehicle finance. He also started strengthening the branch network. To solve the problem of shortage of capital, he started focusing on earning more fee-based income. "If you look at the fee income-to-asset ratio, my guess is we would be at the top," he says, adding that with all the changes happening in the banking sector, be it digitisation or payments banks, what is going to work for everybody is collaboration. At the same time, he says, the bank will continue to focus on increasing revenue/market share and bringing down costs. "He gave a sense of comfort to investors, particularly foreign investors, who weren't ready to touch the bank with a bargepole due to corporate governance issues. Second, he didn't upset the apple cart. He played on the strengths of the bank and built corporate and retail loan books," says a banking analyst from a foreign brokerage. He credits Sobti with making IndusInd the only Indian private sector bank that ate into the market share of foreign banks. Sobti is not surprised. "Our top management was from an MNC bank. We knew where the money was. For instance, MNC banks used to dominate credit cards, but today the space has been taken over by private sector banks. Similarly, in trade and foreign exchange businesses, their market share was disproportionate to the size of their domestic balance sheets," he says. But the biggest inflection point, he says, was the collapse of Lehman Brothers and the 2008 financial crisis within six months of his joining. "It taught us liquidity management, balance sheet management and, most important, how to price loan products," says Sobti, who turned IndusInd into a universal bank so that it could get more bandwidth to weather cyclical storms. To connect with the employees, after the declaration of quarterly results, Sobti does a webcast with the entire staff to share with them the developments in the bank and innovations that are being worked upon. This also helps him get ideas for servicing customers better. One such innovation allows customers to talk to their branch manager. "Whoever uses this service deepens his/her relationship with the bank." Another innovation is 'My Account, My Number'. In this, customers can choose account numbers that they can remember easily. "This was introduced four years ago. Today, 20 per cent people who open an account with us do so because of My Account, My Number," he says. Although the bank has a think tank, most new ideas come from people who regularly interact with customers. 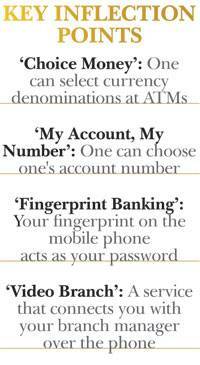 The latest is fingerprint banking. Sobti has a couple of years left to retire. While the years since 2008 have been spent on restoring the bank's health and increasing profit/market share, he has chalked out the next stage of the journey and sent the board a roadmap for the next three years. "Rebalancing the book between retail and corporate by focusing on retail and digitisation will hold the key. Even in retail, the focus will be on non-vehicle finance. Similarly, selling loans online can bring down costs. We are also looking at entering rural banking through microfinance," he says. The next stage of the bank's journey, it seems, has started.